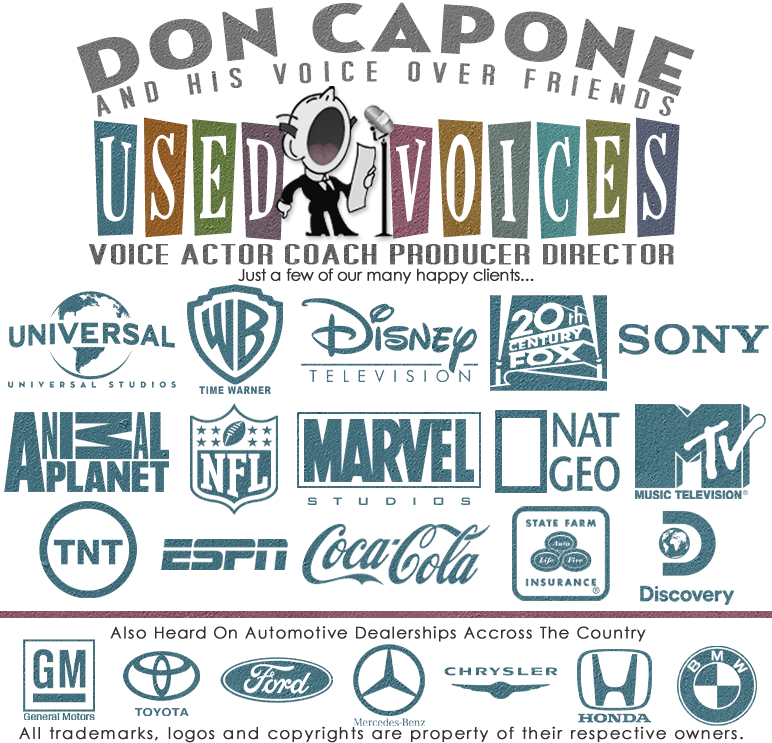 Male Voice Over Talent | Narrator, Voice Actor & Voice Over Talent Don C.
Male Voice Over Talent and professional Narrator. A Voice Actor who can do Documentary Narration, Movie Trailer voice over to TV, and Radio imaging. Voice Description: Powerful Signature Voice, Believable, Deep, Commanding, Friendly, Intelligent, Eloquent, Articulated, Charming, Compelling, Honest, High Energy, Over The Top, Call to Action, Scary Voices, Tough Guy attitude, Ruff Gruff and Gritty, Guy Next Door, Laid Back, Funny, Cartoon Voices, Game Show Host, and Sports Announcer. Impersonations, Characters, Dialects and Accents include: Drill Sergeant, New York accent, Hillbilly, Redneck, Country Voice, Western Voice, Cowboy Voice Over, Texas Voice Over, Southern Voice Over, Pirate Voice, and British Voice Overs. Some Voice Impressions include Sam Elliott, Jeff Bridges, Morgan Freeman, Sean Connery, Jack Nicholson, James Stewart, David Attenborough, Rod Serling, Ray Romano, Marlon Brando and Optimus Prime. Specializing In: Commercial Voice Over, Documentary Narration, Movie Trailer Voice Over, Network TV Promo, Radio Imaging, Character Voices, Video Game Voice Actor, Automotive Voice Over. Experience: Started as a on-air radio announcer back in 1979. Worked for CBS radio for 10 years at same station, also worked for Clear Channel and Infinity Broadcasting. Now do voiceovers for Network TV shows and have acted in a few pilot and an independent films. A few of our clients include 20th Century Fox, Sega, State Farm, NASA, Nike, NHL franchise and Voiceovers for independent Harley Davidson, Ford, Chevy, Chrysler, Honda, Jaguar, BMW, Hyundai, Toyota, Lincoln and Cadillac dealerships across the USA. Also have done Movie Trailer Voice Over, Animation Voices, Documentary Narrator, Infomercials and radio imaging for stations across the country... and the world.